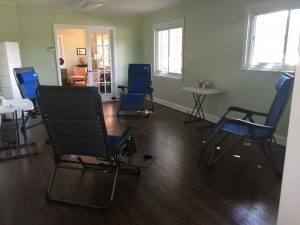 Community acupuncture means that people receive a personalized treatment in a group setting, in a large common room on zero gravity lounge chairs. This allows us to make treatments more affordable and accessible to more people. A community setting makes it easy for friends and family to come in together. Many people find this comforting and when a collective energetic field is established it makes individual treatments even more powerful. Treatments last 30-45 minutes. Please wear loose clothing that may be easily pushed above the knee or elbow. If this is your first appointment please fill out the New Patient Packet before you arrive. Since this setting has several people receiving treatments cell phones must be turned off. You’re welcome to bring headphones if you wish to listen to your own music. Also please be aware that others might be sensitive to fragrances so please do not wear perfume, essential oils or scented body/hair products. All patients receive an initial appointment to review new patient paperwork. The cost is $45 for an initial treatment. Weekly follow up treatments are $30. If herbs or supplements are recommended they are optional and an additional cost.